Finally! PakWheels Faisalabad Autoshow 2017 is here! 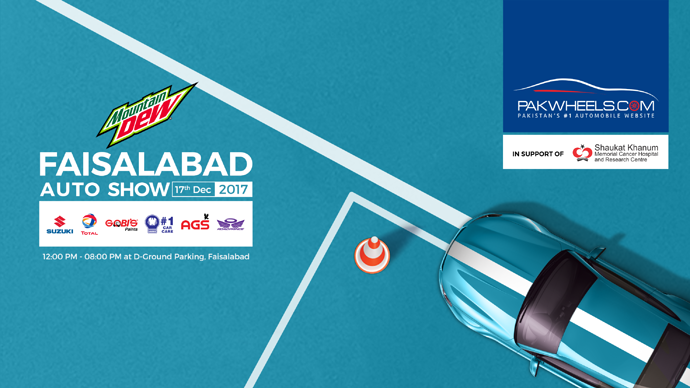 PakWheels is committed to showcasing the talent, brilliance, and creativity of local petrol heads through its Auto Shows. With the same aim and idea, PakWheels once again is coming to Faisalabad for its yearly Auto Show. PakWheels is feeling immensely proud and motivated for organizing Auto Show.This will be the Third edition of Auto Show to be held in Faisalabad. The Auto Show is scheduled to take place on 17 December 2017 at the D Ground Parking, Faisalabad. This show will be featuring six main categories of vehicles including vintage, exotic, luxury, modified, 4×4 and bikes. This premiere auto show is promised to be an extraordinary event as it will be attended by many automotive celebrities. Ending Ceremony Of PakWheels Faisalabad Auto Show 2017!